I’m no SEO guru, but even so, I’m really good at it. My other business, Clinic Supplies Canada, gets 55,000 in monthly traffic. We have 1000 keywords ranking on page 1 in Google. And our website traffic is converting into customers, as we’ve had year after year growth and increasing revenue. That’s the type of thing we all want to see in business, right? Well, it’s all about doing the right things for Google. And thankfully I can help you with that. 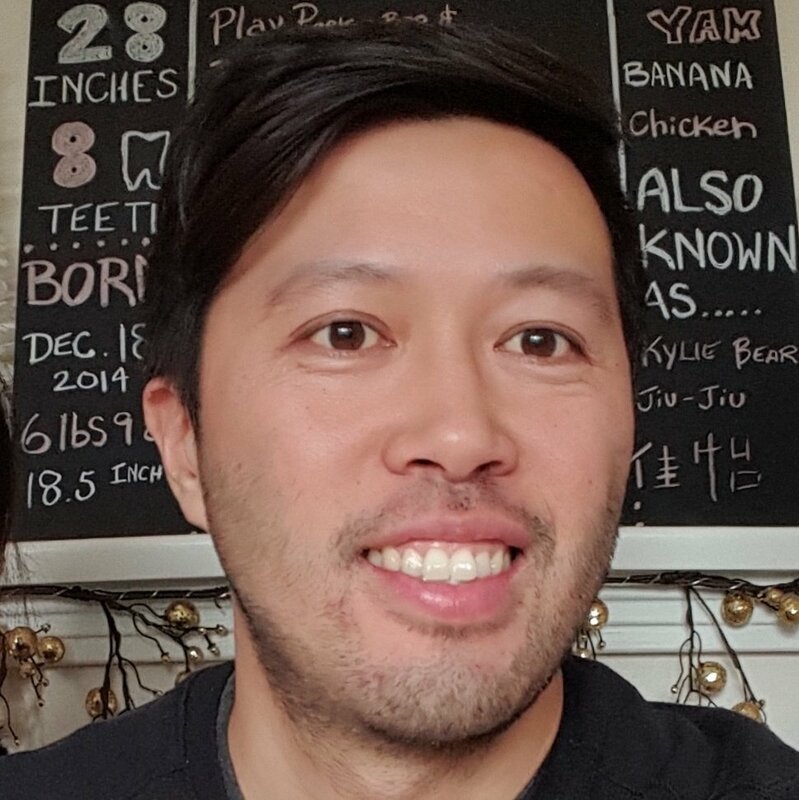 In fact, I just came back from a business workshop for the PABC where I had a lineup of clinic owners asking how I can help them rank #1 on Google. I thought you might be interested to learn the same tips. While it’s easy to go about your merry ways in business, the fact is that Google rules the online world. And everyone is now searching online to find the information and services they need. 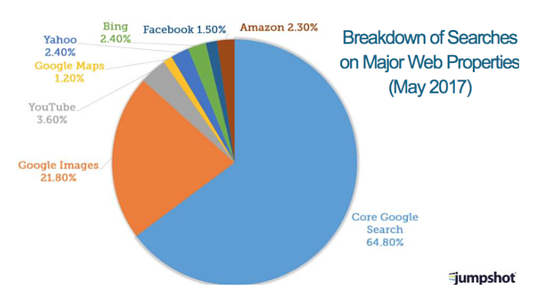 In fact, Google is increasing in market share of search while many other forms of search are decreasing in percentages. 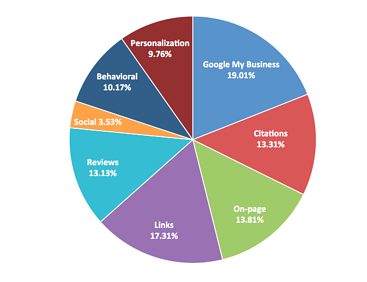 Take a look at this breakdown of searches and see how google make up over 90% of the search queries. It’s pretty clear, we can’t ignore Google - even when everybody is talking about Facebook and Instagram right now! Every single person is going to have a health problem at one time or another. 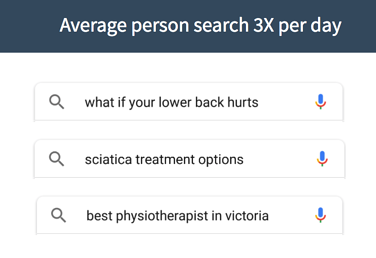 And the average person searches for something 3 times per day. 55% of those searches in Google go to SEO and PPC. SEO are the pages that get listed and are ‘organic’ or unpaid for. PPC refers to ‘Pay Per Click’ Google advertising, which you’ll often see in the top of search indicated by a small ‘Ad’ icon. You can reach SEO searchers by creating quality content on the web via your web pages and by creating informative and educational blog posts for your audience, like I am doing right here in this post. YouTube is owned by Google and many videos also get listed in Google search, so adding video to your repertoire of content can also provide additional value to your business. 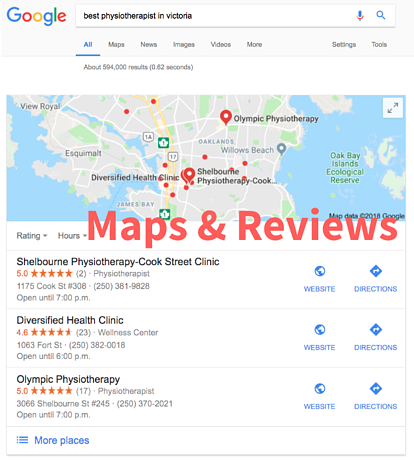 Being a location based business also serves you well because you can list yourself on Google local listing so your business comes up in ‘Maps.’ From there you have the added advantage of acquiring customer reviews on Google, which are fantastic social indicators for both Google and potential patients looking for a reputable business to attend. Everyone wants to be on page 1 of Google. BUT there are only so many spots. AND google is changing all the time - the way they present search, their algorithms, their index. In the last couple of years, Google had 17 algorithm changes. Now the big focus is on machine learning so they can see how people engage on your website. As you can see, it can get pretty complicated. Google will reward you if you do the right things and run a good business! You need to start managing your website the same way you manage the patient experience. Focus on your website engagement. If somebody clicks on your search result and lands on your website and doesn't do anything afterwards, google doesn't like that. This is why its super important to measure conversation rates on your website so you know whether your content or marketing is working or failing. And if your marketing company is not doing this for you, dump them! That’s the simple answer to SEO. Is your traffic staying on your site? Being engaged? How do the numbers stack up? Do your readers and customers share your content socially? Does your website traffic have a good conversion rate? 2% vs 10%? But there’s something more important and deeper to understand. YOU NEED TO START MANAGING YOUR WEBSITE THE SAME WAY YOU MANAGE YOUR PATIENT EXPERIENCE AT YOUR CLINIC. Your website is a living organism and is an integral part of the patient experience. Don't do what most clinic owners: they build the website and then forget about it until is outdated. In fact, your website and the experience it provides, is often the first impression people will get of your business. And that’s what healthcare consumerism is all about. It’s here and it’s here to stay! People now have the ability to judge healthcare in the same way they judge retail, and believe me, they are constantly doing it online. Amazon and Apple have forever shaped how people purchase things. They want a great experience and they want it fast! Years ago there was no other option. People would call a local place, go in and if they received bad service is was kind of a given, there was no recourse for that, not really. With everything so connected now, customer service and the healthcare experience is of critical importance and it all begins the moment a potential patient lands on your website - does that make sense? Are you giving people a good experience from the moment they click on your website? Are they calling your clinic to book an appointment? Are they giving you their email address for a ebook you have? Are they sharing your blog content on social media? Do they hangout on your website longer then your competitors? 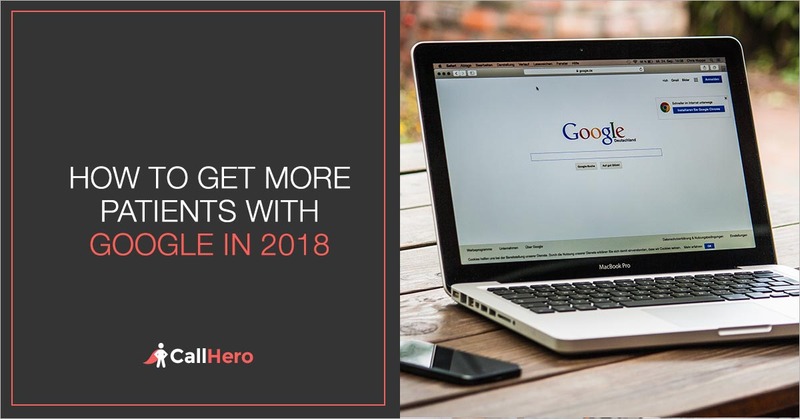 The point is: Google is important in 2018 (and beyond), so don’t get left behind. Use the above questions and ideas to assess where you are right now and what you can do to help Google favor your business. 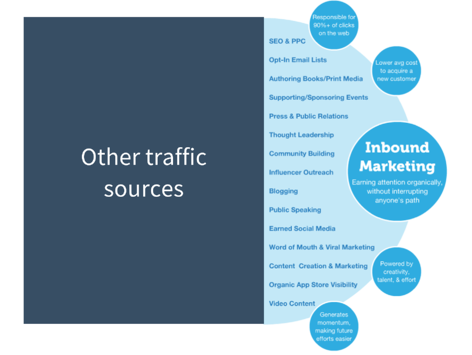 Getting the traffic and new patients coming to your site is the first step. But what happens when they call your clinic? Is your front desk answering the phones? Do you have any phone call analytics? Are they using proven scripts that help increase your conversions so you’re not losing customers on the phone? Are you converting 40% or 80% of new patients calling your clinic? 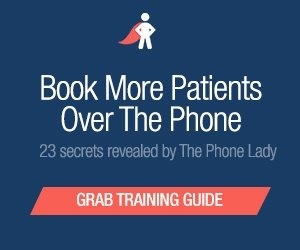 You can double the # of new patients in your schedule with the same # of phone calls if you get this right. You need to ensure that your front desk staff is doing their absolute best at answering the phones and communicating with customers. Use it to train your staff the right way, and then you’ll be converting every customer that does come from Google.